Japan is a well-known country worldwide for its unique cultural style. Japanese tattooing is part of the development of the rich history of this country and is of interest to most fans of this trend in art. But how did the Japanese tattoo appear and evolve with time? There is a theory that for the first time Japanese tattoos appeared in the Paleolithic period about 10,000 years B.C. It was found that in those times the Japanese began to paint their faces and bodies with special drawings, vesting them with decorative and spiritual meaning. However, not all scientists agree that such distinctive patterns could really be called real tattoos. Then, in the Yayoi period, between 300 B.C. and 300 A.D, the presence of tattoos on the bodies of the inhabitants of Japan symbolized social status and also had a spiritual meaning. But in the period after 300 A.D. and until 600 A.D. the perception of this art has changed significantly, and tattoos began to be used as a punishment among criminals. However, such a style of Japanese tattooing as we can observe it today came to us from the period that was known as the Edo period (from 1600 A.D. to 1868 A.D.). At that time, tattoo artists used different tools to create their own engravings such as chisels and potholes. Moreover, the vast majority of tattoo artists used Nara-ink, which changed their color to blue-green when inserted under the skin. Also, there is no definite opinion on who had tattoos in Japan. Some believe that tattoos were the privilege of wealthy merchants, others, on the contrary, associate them with the lower class, and still others believe they were people who performed dangerous work, which used Irezumi for their protection. However, the situation changed again and at the beginning of the Meiji period (between 1868 and 1912) the Japanese government declared tattoos outlawed in order to preserve their image for the West. Despite this prohibition, tattoos were still popular and used illegally among criminal groups, and attracted foreigners who came to Japan in order to see the famous Japanese tattoo artists. During the occupation in 1948, tattoos were again allowed for Japanese population, but their use was still associated with illegal activities and criminal responsibility (especially with the famous Japanese mafia Yakuza). 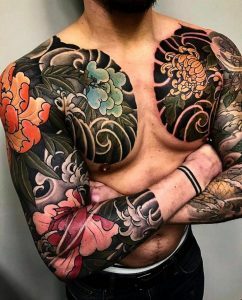 Today, the western tattoo is more popular among the Japanese youth, who bring their own sketches of tattoos to the artist or choose from the offered in the tattoo parlor. The ink is inserted under the skin with a needle. But some people still disapprove this element of art. It is not easy to find a good tattoo parlor outside the tourist areas or areas with US military In Japan. Despite such discrimination in Japan, Japanese tattoo artists are considered to be professionals in their field. This country is still positioned as one of the best all over the world, where you can make a quality tattoo to your taste. Some very experienced tattoo artists still practice the ancient art Irezumi, but this is well-known as a very long, painful, and too expensive process.